"Because It's There", I heard the words of Late Mountaineering legend Mr. George Mallory and began preparing myself for a professional course in mountaineering. It is always better to give a professional touch to our passions, especially when the passion is adventure sports. Our dorm is opposite to the washroom which has advantages and disadvantages both. We had our breakfast and were told to line up for collecting our equipments. 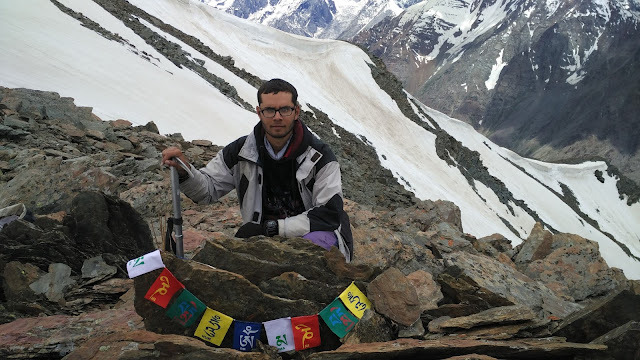 Half sleeve feather jacket, Lower made of Polyster, upper windcheater, monkey cap, sleeping bag and its inner, a mess tin, sleeping mat, Gaiters, seat harness, rope sling, one carribiner, helmet , Ice Axe and ofcourse a Rucksack. We even got a rubber sole attached to our canvas shoes from the cobbler at the institute, this provides a good grip in rock climbing. After that we had a museum visiting session after lunch and we saw all the equipments. It was a great time having a look at traditional climbing gear. The day seemed quite free as students were still joining and the number finally ended at 114. 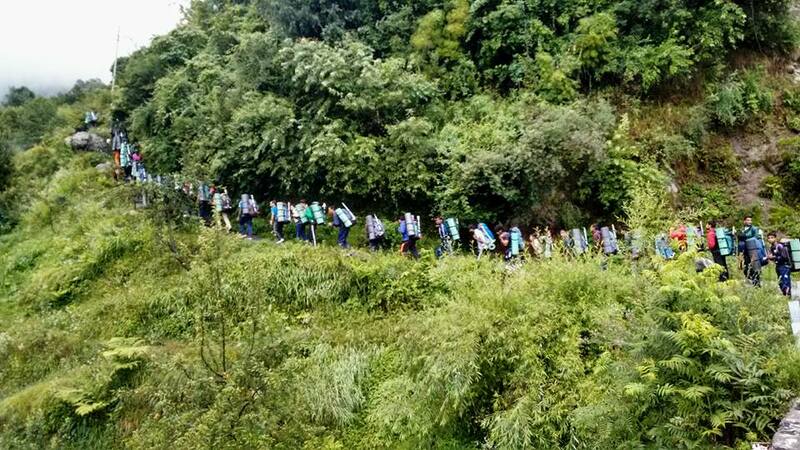 Yes, there were 114 students from J&K to Kerala and Gujrat to Meghalaya. In the evening 'fall in' (term used for assembly of group) we were divided into 14 ropes , 8 in each and respective rope leaders were selected along with a course senior, an equipment in charge and a quarter master. We were allotted rope instructors who would train us for next one month. Later we headed for our first knots lecture, it is the most important part of this course and we learnt over 10 knots in a single day. Late evening we were given instructions for the next days schedule. 5.30 morning tea followed by a PT and a 5 km run. The PT instructor was the best and most humble instructor we saw during the whole course (Mr. Bhag Singh Chauhan), he was always there to ask if we had any issues with our training. 8.30 AM was our activity fall in and various 'central equipments' (these were common for everyone and to be returned after activity) like ropes, carribiners were distributed to us rope wise and we had to carry the load on our back. 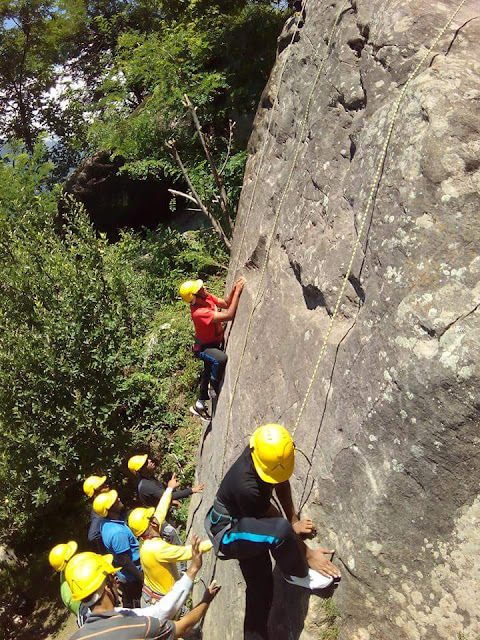 The first day was rock climbing , we were given a demo and soon we were made to climb on big rocks and boulders with an inclinations of 60 to 80 degrees. We were told to just focus on techniques of eye climbing and finding the correct holds to place the hands and feet. We all did well and climbed 10 to 15 feet on every patch. 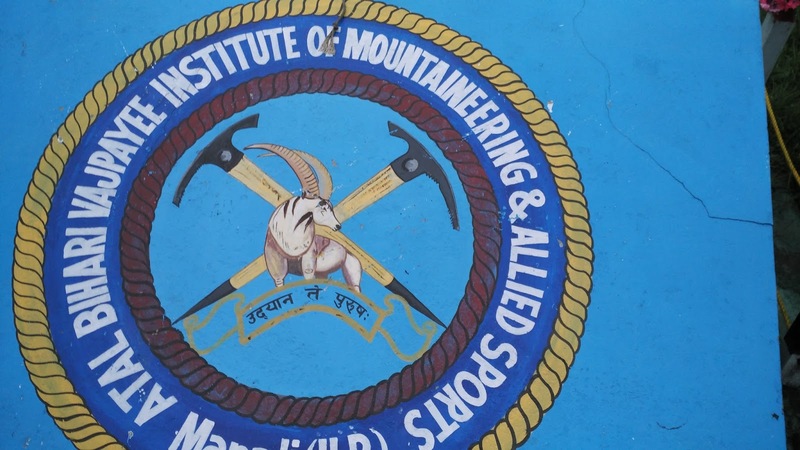 The rock area is just 3 kms away from the institute and the best rock field indeed. One can practice almost every technique over there, from overhangs to chimney climbing. We returned and had our lunch and after that we had a lecture on mountain manners. The lectures used to be very interesting as we often heard some mountaineering stories as part of examples and later another lecture on knots. 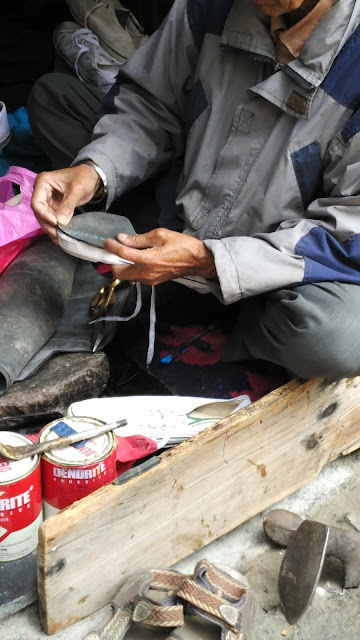 After that we were sent for purchasing rain sheets (Monsoon days) and canvas shoes for rock climbing. It's duty of our rope today and we have to serve food. We were given duties to serve food rope wise and we had to serve the breakfast, lunch, evening tea, and dinner. I was in rope no. - 2 so it was ours duty today. Duty day is usually very hectic but fun at the same time. Again the same routine was followed, but this time our morning run was increased to 9 kms. Today we did better on rocks than we did on previous day and we were taught about belaying and placing anchors on rocks. The lunch was always great , but we get to eat less on duty day as our rope was short of time. After lunch there was a lecture on avalanche, which was again an interesting part. The post dinner fall in used to be really interesting as it was dark and we used to Shout, scream and make funny voices. 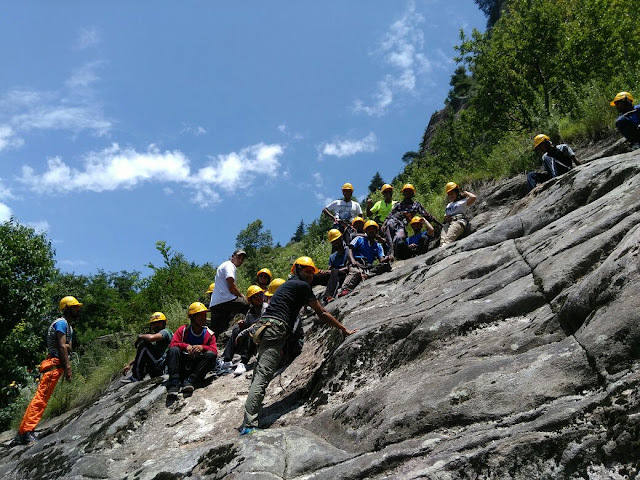 After fall in we had chats and fun outside hostel. One day we were lucky enough to capture a flying squirrel in our camera after fall in. 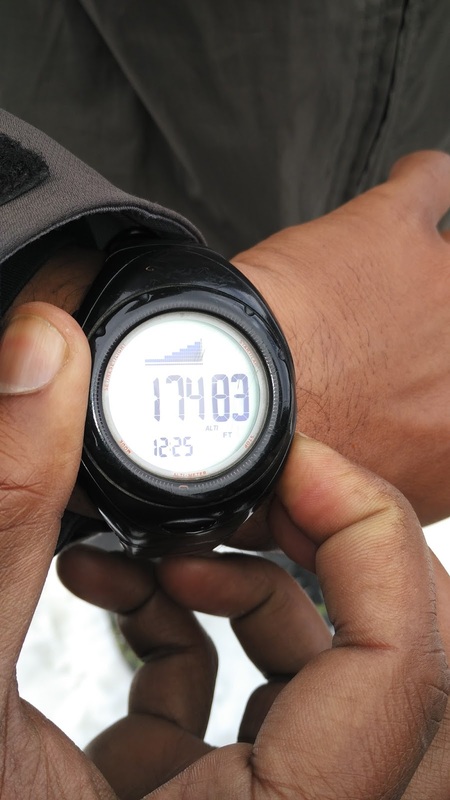 Today our morning run had increased to 12 kms, though most of us had to walk the last 4 kms. Running at such an altitude is not that easy, especially when you come from 300 meters above sea level. 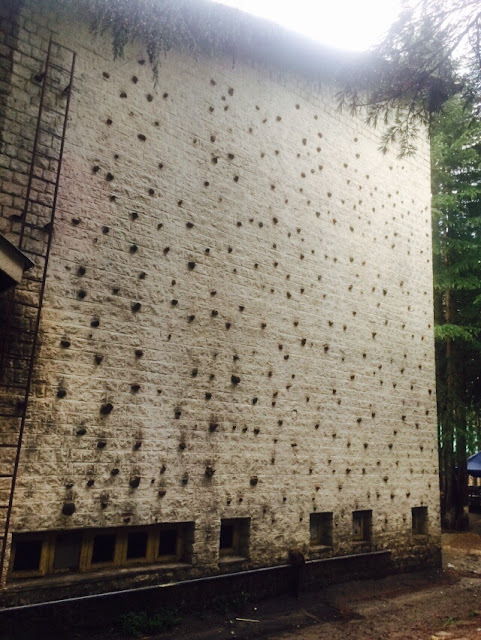 The artificial wall at institute is really strategic with different levels of difficulty. We performed well and learned belaying through autolock 'grigri device'. Many candidates had prior experience of wall climbing and were the once who did really good. Post lunch we had a lecture on mountain hazards and rucksack packing, which was again an interesting part. Now we were told to wear dirty or old clothes as we had to begin our obstacle course. The joy of doing obstacles is that we get dirty in mud (reminds of childhood). We had to walk on bars, cross a 9 feet high wall. We used to push our friends from down so that somehow they climb the wall, then crawling under the bars and jumping through tyres. And obstacles now made us take bath every evening with cold water which we had been avoiding. Yipee! !, no morning PT today as it is raining. But we had a yoga session. 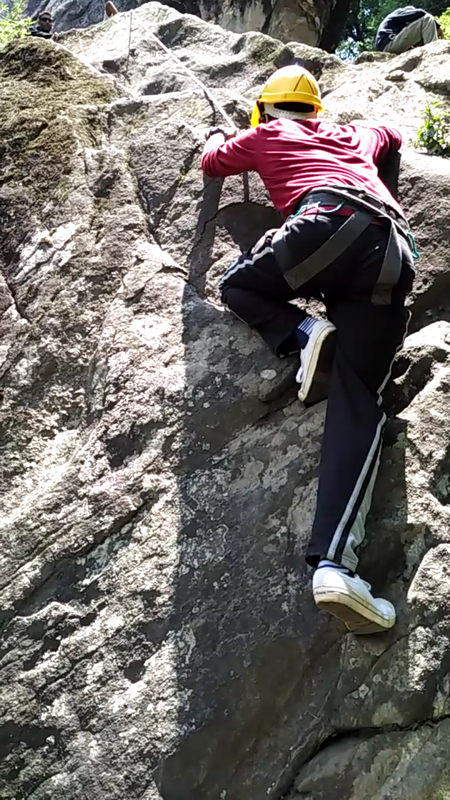 Today was the swap, our group was sent on rocks and the other had to climb wall. It was the last day of our rock climbing, so we practiced climbing in a chimney like crack, we even descended with our forelimbs without rappelling. It was fun. Post the lunch we had our lecture on first aid in mountains by a doctor and after that was an obstacle course again. Three rounds for everyone, but the PT before obstacles made us fully tired in second round itself. There was no PT today as we had to trek to Hadimba mata temple with our 20 kg bag. But they made us climb the stairs instead of taking the original path and that was our real test. 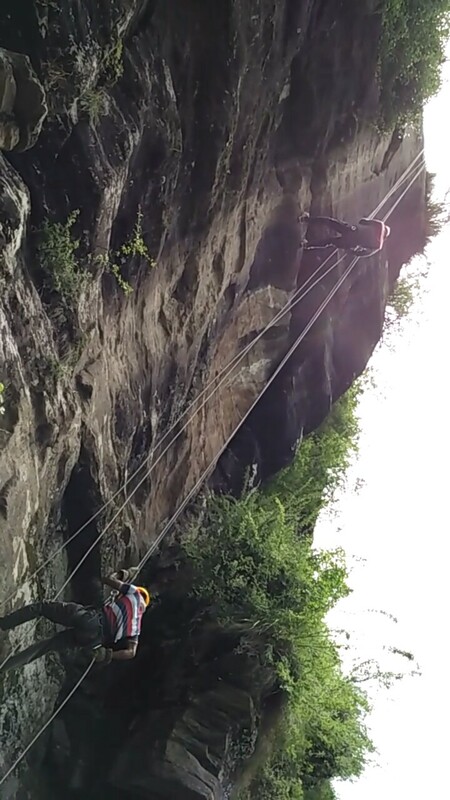 Later we again moved to rock field as we had to do Rapelling today. But due to rain we could only see the demo and had to return. Now the time was free so we heard the Fall in whistle and it was movie time. But to our bad luck the projector stopped working after five minutes and movie also got cancelled. Post lunch we had our knots test We were alloted a sequence which we had to remember althrough the course for assessment. Test was quite easy and interesting too. 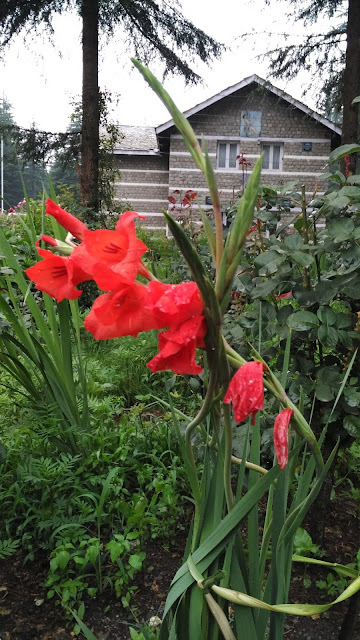 Evening was without obstacles as the field was wet so we went behind the institute in woods on the bank of river Beas. We had fun, clicked lots of pictures. The whole day is free and we can chill and just chill. 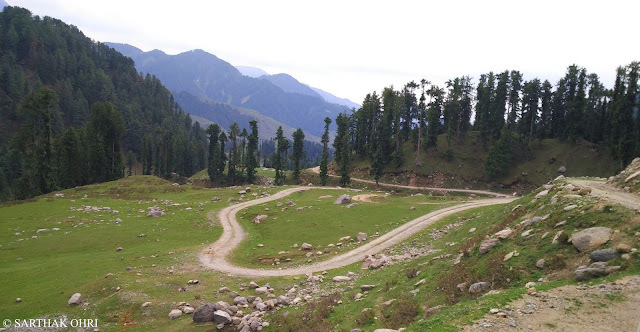 I along with three friends visited vashisth temple and jogni falls further two kms from there. 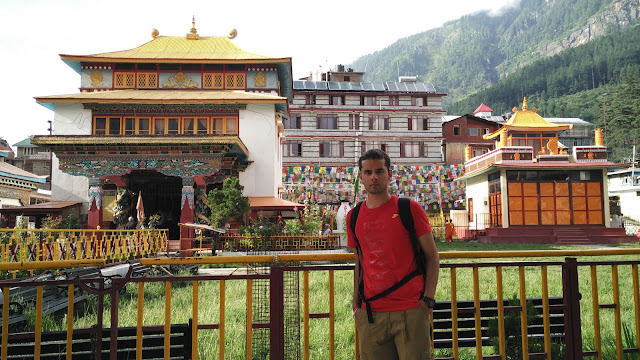 We came back to Hustle bustle of Manali town and walked towards old Manali, the hub of Manali's best cafeterias. We had lunch at mall road along with three more friends and then we had to buy some essentials like goggles for snow and snacks to eat. 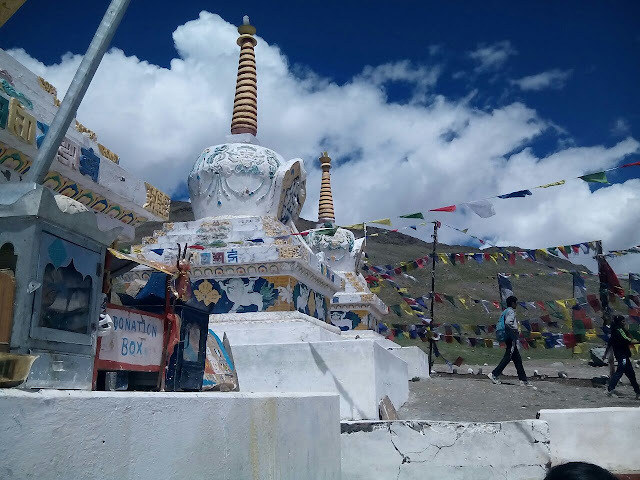 We even visited monastery on the Gompa road near bus stand. It was just beautiful. We returned to institute by 6.30 before the reporting time and we didn't had to go through push-ups punishment for being late. We walked 13 kms that day. Its again running and PT time, back to the old routine after a day full of enjoyment. 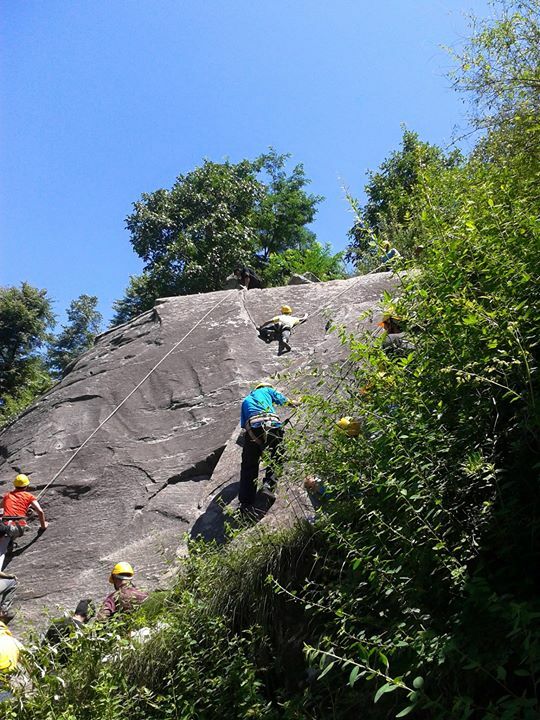 Today we did two activities in one day, Rappelling and Jumaring. Rappelling is fun and quite easy, Jumaring needs stamina and the concept should be clear else you can get tired midway. All needs to be done is use your lower body strength as much as you can. We reached institute by 2 pm and had our lunch. Later we had lecture on map reading and navigation. This was really an important one. The obstacle course activities resumed and luckily it turned to be the last day of it. After dinner we were told that tomorrow will be river crossing. In morning we were taken behind the institute into woods for morning PT. 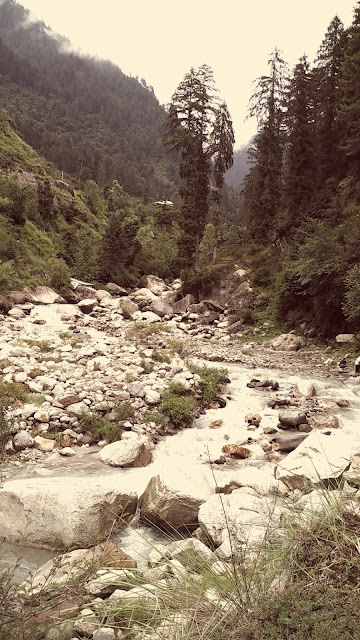 Later we went for river crossing at Jagatsukh village 6 kms from Manali. It seemed like a long walk (maybe because I was walking in the wrong shoes today), but the valley was really beautiful where we spent time crossing the river. The water wasn't much cold but it was a good experience. We learnt how the first man crosses river to tie the rope to the other side. 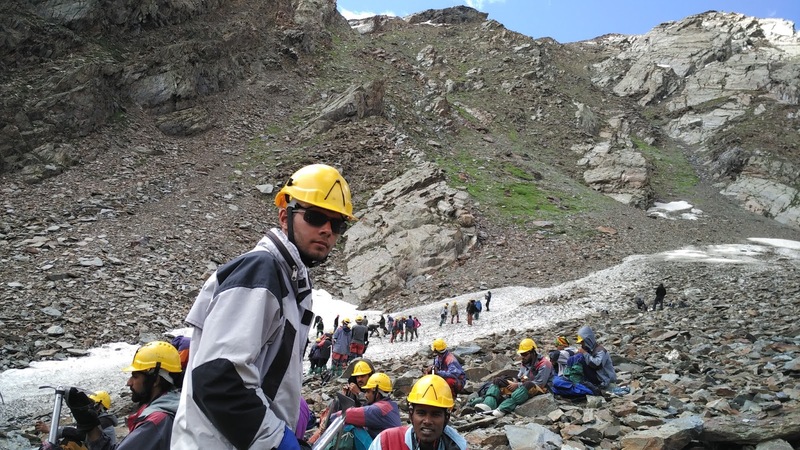 Later we had a lecture on Himalayas, the best lecture as we discussed about various peaks with our sir. 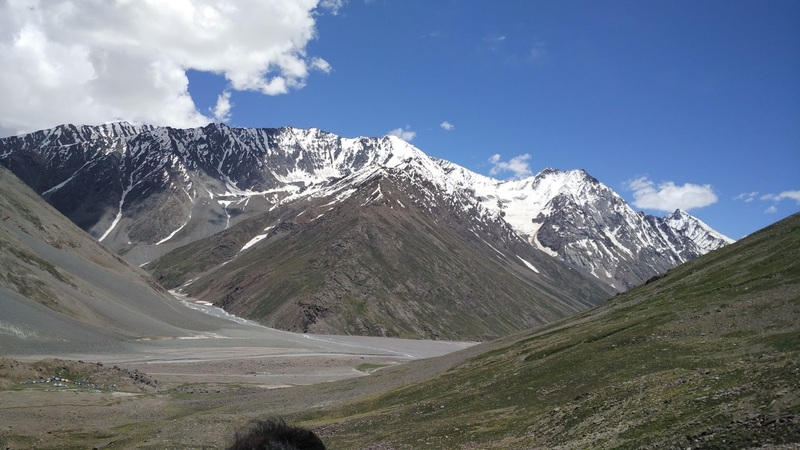 And we were officially told that we would be tavelling to spiti this time instead of traditional beas kund area. 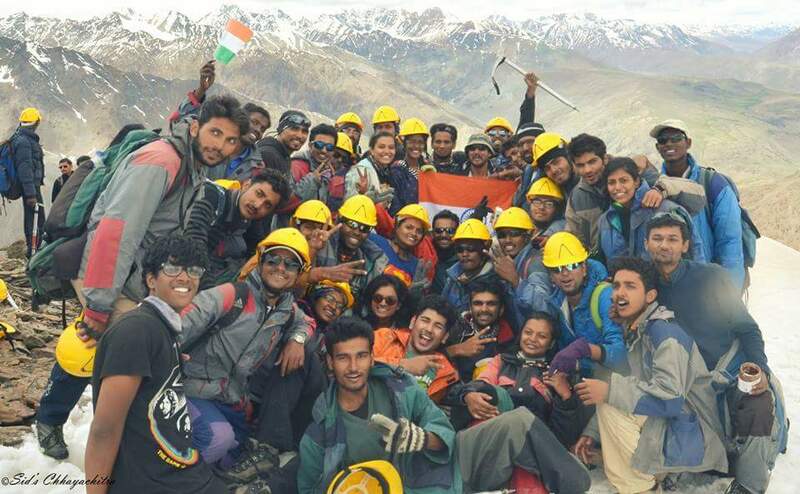 All were set in joy and we had to deposit 1300 per student with our rope leader for travelling there. There was no PT but we had to trek with our full sack to sharvri temple in Jagatsukh village at 4.30 AM. The view from there was mesmerizing. There was no physical activity today as we were to be issued snow shoes and crampons for walking in snow and ice which took almost whole day. We got the crampons adjusted and had a library reading session where we read adventure books on Everest and other peaks. After lunch we saw film 'K2' as this part was still pending. We even had a lecture on tent pitching after evening tea. 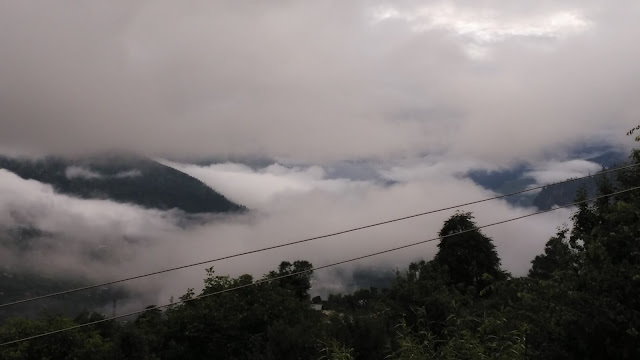 The morning exercise was to trek to vashisth temple and have bath. We returned by 7.30 AM and had our breakfast. Today was scheduled as rock climbing test but due to rain it got cancelled, and we had our second knots test. Almost all did good and scored well. After lunch we were sent to market for purchasing necessities as it was our last day in Manali. We did some shopping, we had thupka (a tibetan dish made of soup and noodles) and came back. We were supposed to submit our luggage in clock room by 9 PM. I Called home as I was to be out of network zone for the next 13 days. This was the day we were moving to Batal. 16 Tata sumo were standing in a line waiting for us. We got our packed lunch in our mess tin and all were set for the journey with full packed rucksack and a day sack. We left a 9.30 AM and as our car was fifteen minutes ahead of everyone so we got enough time to play in snow at Rotang. (reviving our childhood). 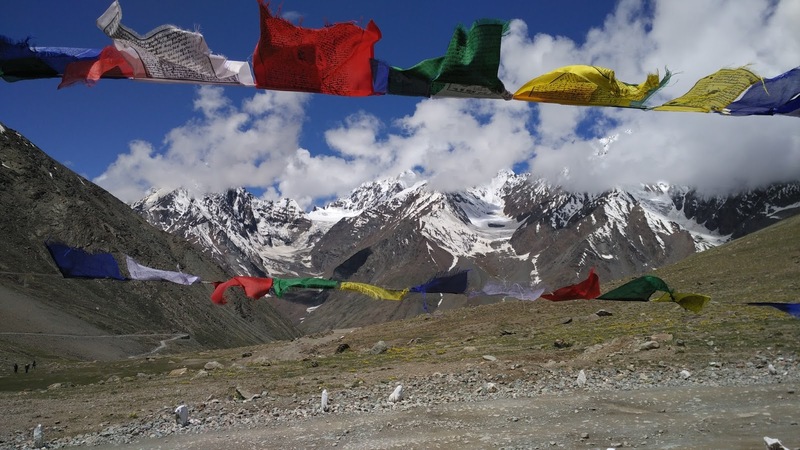 Soon we entered the great spiti valley and took a turn right from gramphu (the other road goes ladakh), we were heading towards kaza road and at chattru, the first and only dhaba on our way we had our lunch and began our journey to Batal. (Let me mention if you cross hampta pass from manali to enter spiti, you end up reaching chattru itself). We reached base camp by 3 pm and pitched our tents. Five guys in a tent was the criteria. 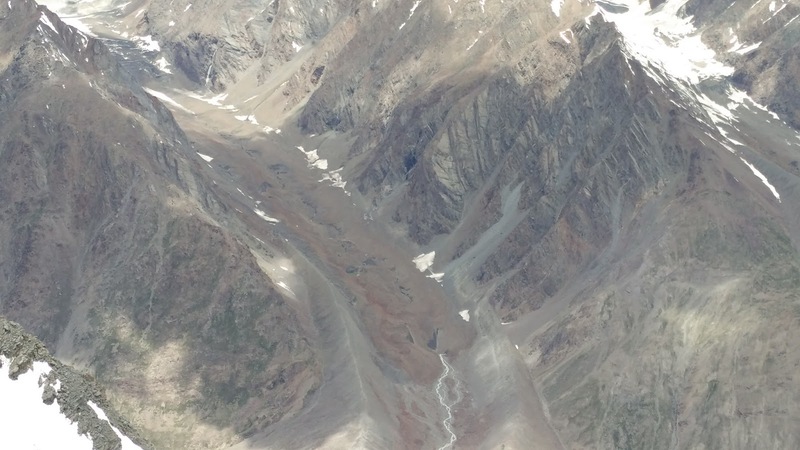 The altitude was recorded at 13,100 feet. All were very excited as the place was really beautiful. No vegetation, but amazing views. There was a small stream flowing through the campsite which was to be used by everyone. The mess in charge had dug out separate stream for the clean water for food. 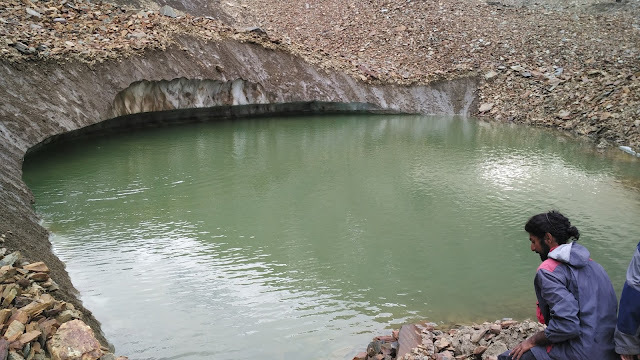 In evening we were taken to a hill behind our tents with our Ice axe and we were told to dug a pit for our early morning discharge and close it every time it gets filled up. But no one could ever find his pit again in so vast toilet area. The campsite was set up and we were told about our next days schedule. The first night after drinking a hot coffee was really helpful in acclimatization process. 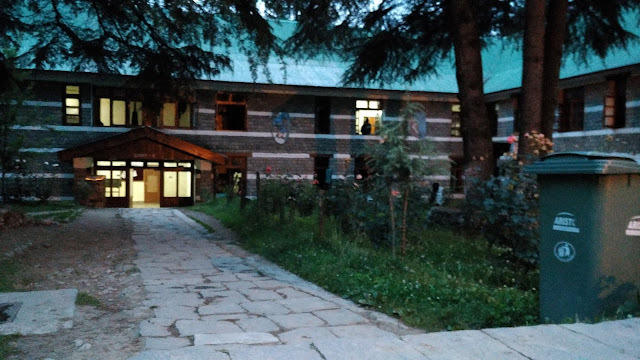 Early morning with a bed tea and washing the face with cold water made us realize that we are no more in Manali. The campsite was surrounded by various big mountains not very far and beside our camp across the highway was the fast flowing chandra river. I did mountain gazing with my binoculars every morning trying to locate if I may see a climber on the way to summit. 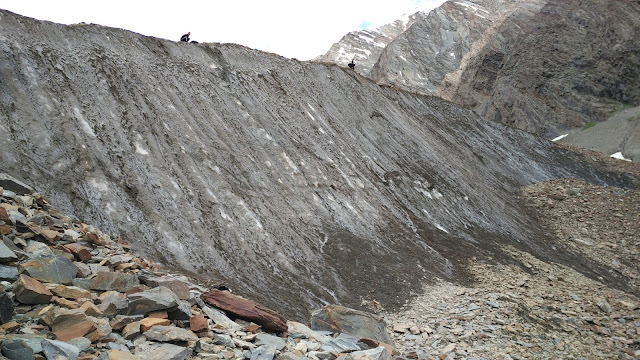 We had our breakfast, washed our mess tin with sand and marched towards kunzum pass by taking many risky shortcuts and crossing streams. 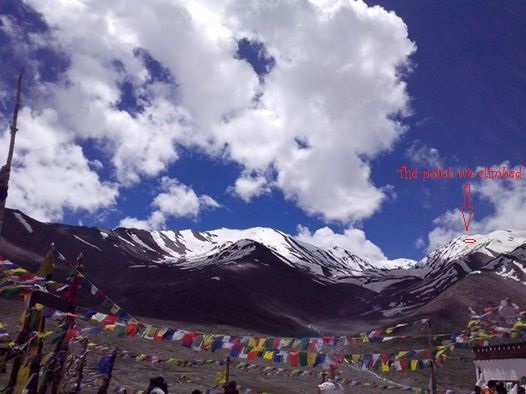 The pass at 14,900 feet is really a beautiful creation of God with snow covered hills on both sides. There is a temple on the top which has a magnetic rock. If your coin sticks on it your conscience is pure. Luckily I made it in first attempt. We rested there for two hours and almost all of us slept there because the heat of the sun was perfect for a nap which further helps in acclimatization. We came back by 3 PM and had our lunch, after which we had a lecture on camping and camp hygiene. 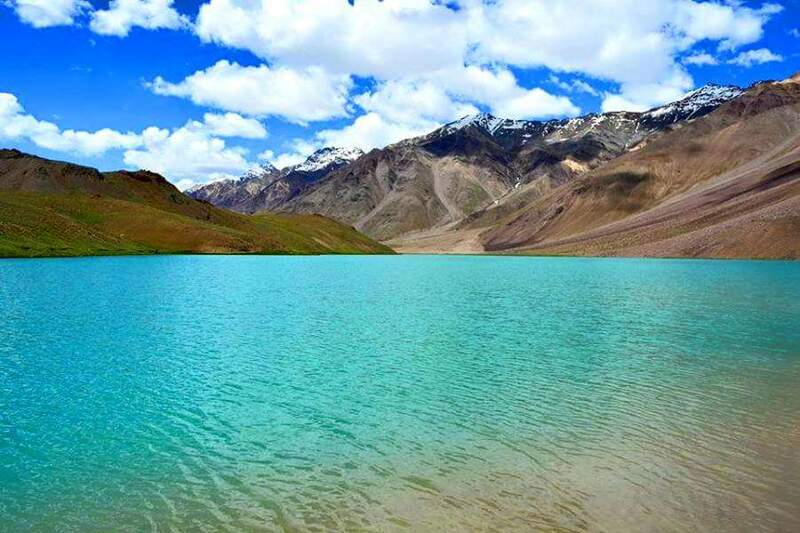 Batal is a place where one can experience extreme winds which may even blow away your tent. And the same happened with our dining tent. Though we never pitched it again. We had to trek to our activity site so that we can understand the route. Route was very very long tiring as we had to walk over moraines and loose rocks as if a large landslide had occurred over there. Then our instructors went further to check the conditions of Ice wall. We were back by 2.30 PM and had lunch after which was the rest time and some of the instructors with students played cricket and some volleyball. Some like me were enjoying nature and visiting the dhaba for maggie or biscuits. There is a dhaba beside our campsite afterall we camped next to so called 'National Highway'. Later we had a lecture on snow shoes and we practiced walking in them at our camp site. They say washing mess tin with sand removes oils, but washing it at night was a nightmare. No electricity only head lamps or torches working. After breakfast and washing the mess tin with sand we again set off on our journey. 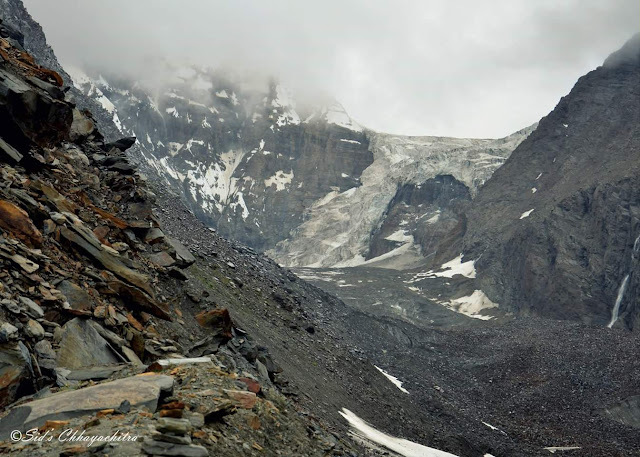 We headed towards the snow field with our rucksack on which had only required items. 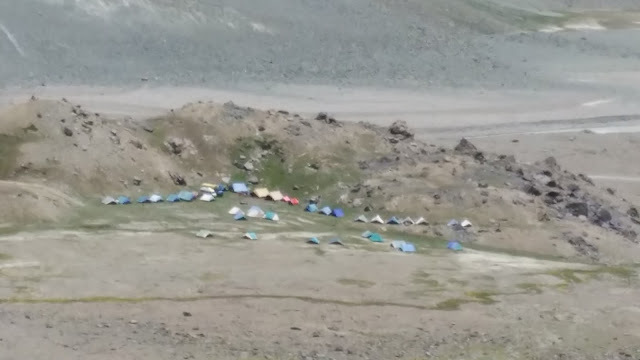 Till now most of us had arranged a second waterbottle for ourselves as the route we traveled on did not had any water source the closest one was near the camp only. We practiced different techniques of walking on snow. We were back by 3.30 pm and had our lunch. There was no lecture now but a hailstorm to welcome us. The temperature dropped 12 degrees in half an hour. We suddenly heard a news that the advance course instructo had a fall and was injured badly. 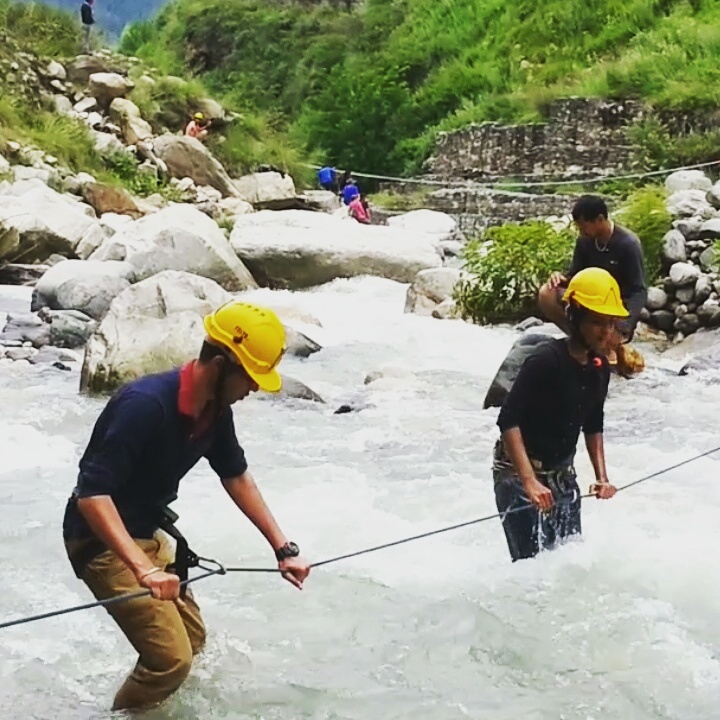 His leg had broken and a team of our instructors went up to the chandra river (near karcha naala- a point were crossing chandra river gets very risky) to evacuate him as he was brought by advance course team from the other side of river. We asked them if we can volunteer but our instructors couldn't put us at risk, I and my friend gave them our binoculars as they needed it to spot the rescue team. Later the casualty was brought to camp and transported to Manali early morning. We had dinner and our Bournvitta drink and slept. The breakfasts were always the same, roti, aloo subzi and dalia (porridge). At this point of time we had started using only one part of mess tin so that we don't have to wash both boxes every time with icy cold water. We had started to mix everything and eat in a single box. Based on our needs and exhausted by aloo and roti we had to be creative and we learnt the art of jam roll, dalia roti, and mix veg roll. We learnt how to arrest our fall if we slip on snow using our ice axe. We also learnt glissading , a technique of descending fast on snow. Till now we had become habitual of walking on rocks and stones so we came down running today, but the aftereffects were that everyone had a minor knee pain. We were back by 4 PM and had lunch. Later in evening we used to discuss various topics with instructors and hear their stories. 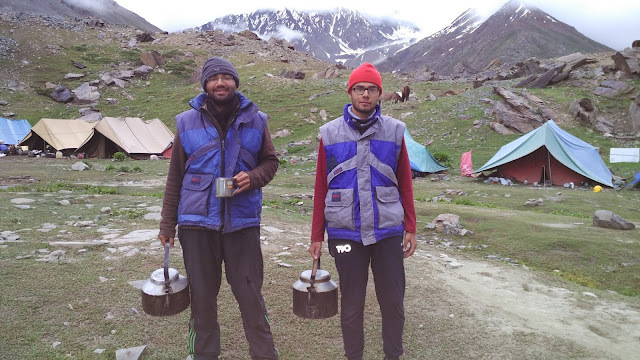 It was our duty rope again and I volunteered to serve tea with two others Going tent to tent and calling 'chai chai' in our own style was fun. Bed tea call was more seriously taken as a wake up call rather than tea time. We did served the breakfast and I today the food was special (egg bhurji) which ofcourse finished very soon. Today we learnt how to fix anchors in snow and how to arrest if the members of team fall when roped up. It was a good experience. In evening we had lecture on crampons and how to fix them to snow boots. We had Maggie at dhaba, purchased dairy milks, hide and seek and returned back. 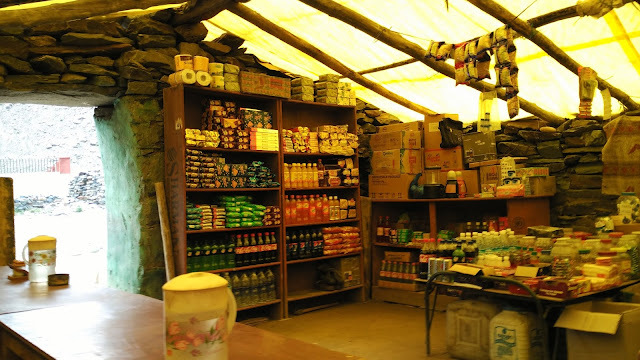 Dhaba at Batal, on the main road that goes to Kaza. We walked double the distance we used to walk for snow craft. It took three long hours to reach the Ice wall. By the end the route was very complicated with sharp edged moraines while edges were facing up at many places and we had to make our own route. Then we walked over moraines and reached the destination. Our Ice wall was on CB-12 Glacier. We had lecture on ice climbing and we tried our best to climb the wall. There was a 'free climb' option available on the side of wall where we could climb freely without any belay rope up to a certain height. I spent most of my time there as I felt comfortable adjusting my toes by hitting into ice. I did not even had a fall during the climb and that motivated me. The crampons were not very good and became loose very often. 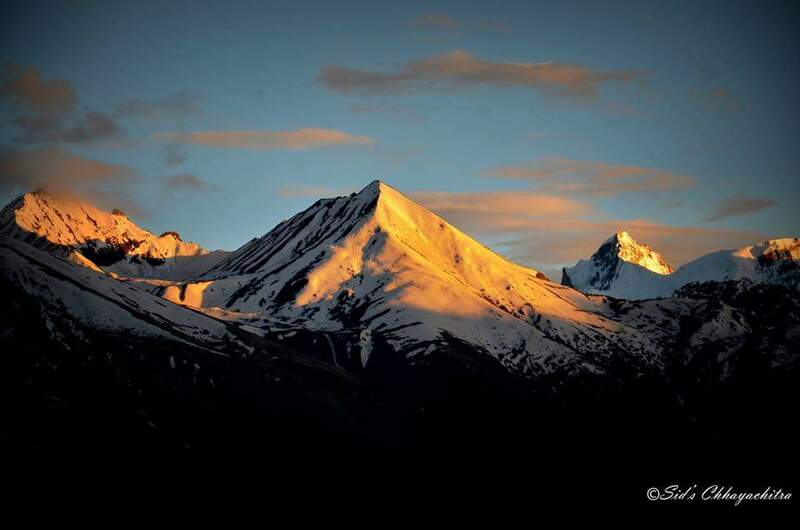 Today we had a lecture on glaciers in Himalaya in evening and later we enjoyed another awesome sunset. Peak Climbed by Advance Course. As usual waking at 5.30 AM and many of us moving towards the toilet field with a bottle in one hand and ice axe in another to dig a pit. Today no one wanted to go again for ice craft that far, but we had no options. We left for the field with our rucksack and refreshments, and we were told that this would be our last day on Ice and everyone looked so joyful as if we were a bird and had been set free from a cage. Some ropes were left for people who wanted to practice climbing using their ice axe and some of us including me also practiced how to fix an screw piton in ice. We would no more see ice in this course now and we began a photosession on the way back too. 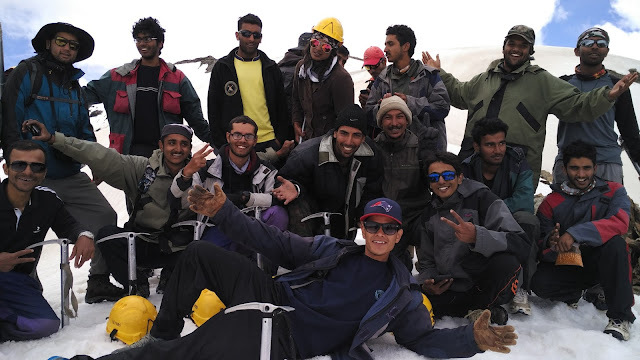 After walking for long on rocks we preferred to take snow path on our way whenever we encountered a patch and that was the time I realised why people prefer snow route during climb. 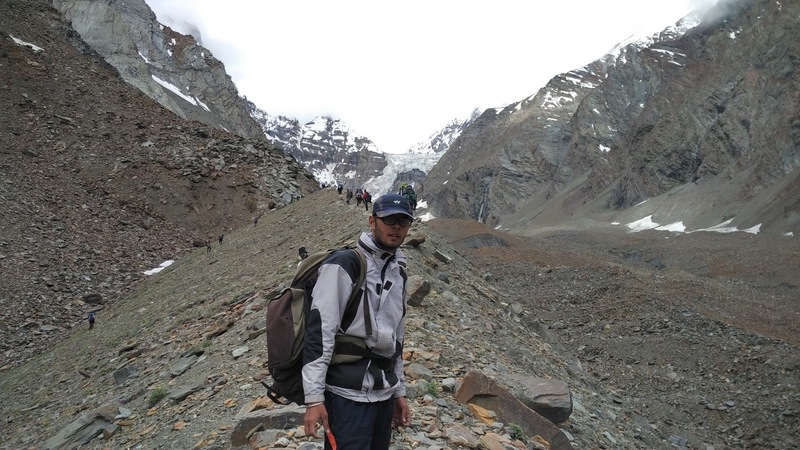 On the Way Bac to Base Camp from Ice Field. We again reached at 5 pm and yesterdays routine followed including a maggie and a pack of hide and seek biscuits. We were about to have a lecture on mountain terminology when our director visited our camp surprisingly. 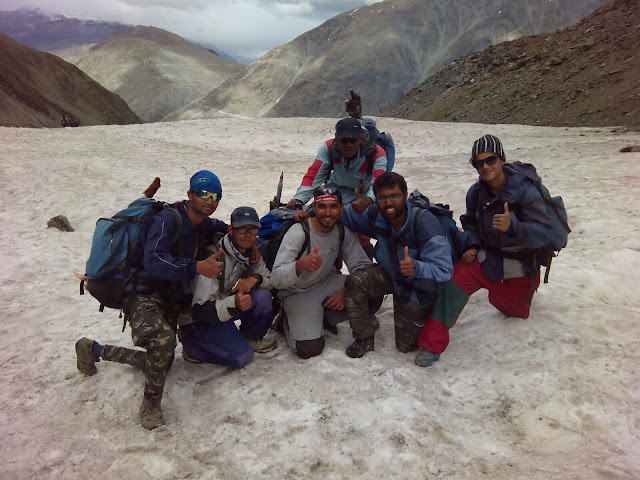 This time he had accompanied advance course in the expedition and their camp was not very far from ours. He motivated us and took a briefing about the activities we did. The fall in was at 9 AM instead of 8.30 AM as we had to trek just nearby the campsite where we were taught various techniques of rescuing someone if he falls in a crevasse. 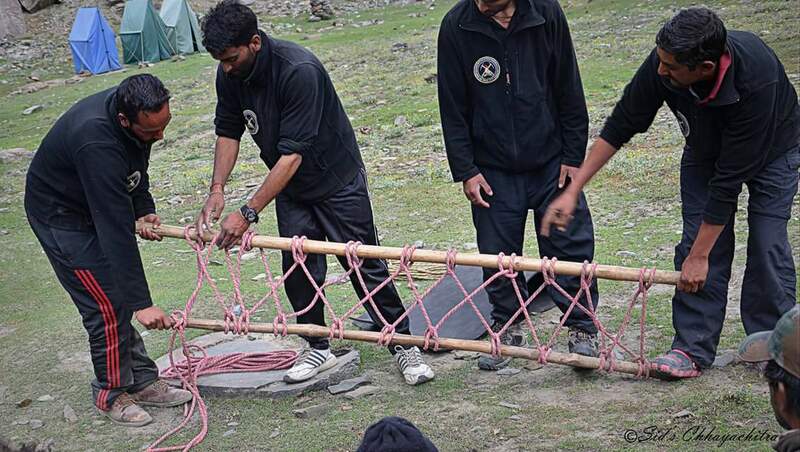 We practised various types of setups prepared to rescue someone using ropes and pulleys. We practiced them and reached the camp by 12 P.M. This was the time we used to reach our activity site a day before and today we were all free by now. 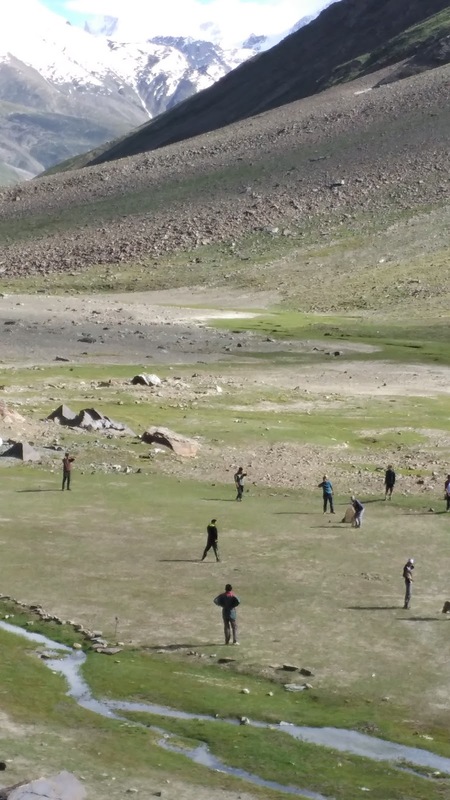 We took some rest and some of us began playing cricket. I was mostly found on a nearby rock with some friends and we used to discuss about treks and mountains. 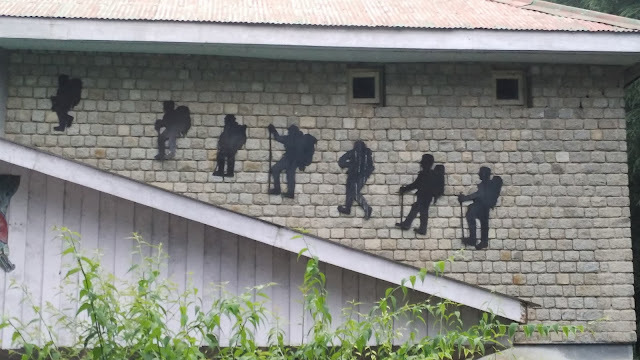 We had a lecture on mountain terminology and were informed that tomorrow will be our height gain day and we shall try our best to do atleast 17,000 feet. Everyone was extremely happy and we were distributed dry ration like toffees, biscuits, chocolate's and dry fruits as there would be no lunch tomorrow. As we exit batal, we cross a bridge and just after that is a temple, where we offered prayers as this was the real climbing day of BMC. 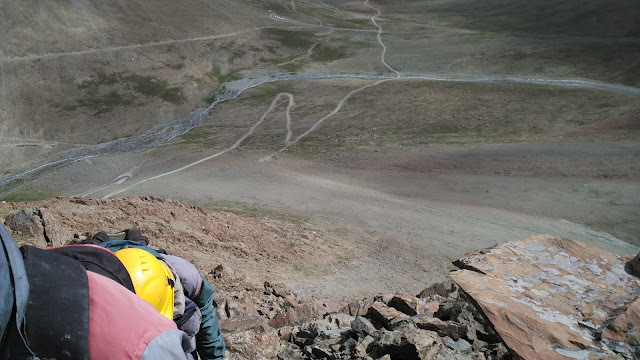 We reached the kunzum pass by 8.30 and just before the pass we started the steep section at its right and started to climb the hill. Later at some point near 15,900 we started to feel that the oxygen level started to decrease but we all were quite comfortable. 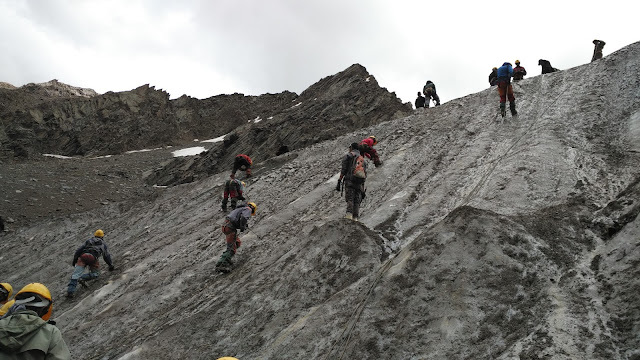 As we trekked over loose rocks the size of moraines started increasing, and on some we could even practice rock climbing, but today our motive was to gain height and not jump over rocks. We took rest at a point and the altimeter read 16,161 feet. We had already attained our qualifying height of 15,500 feet. 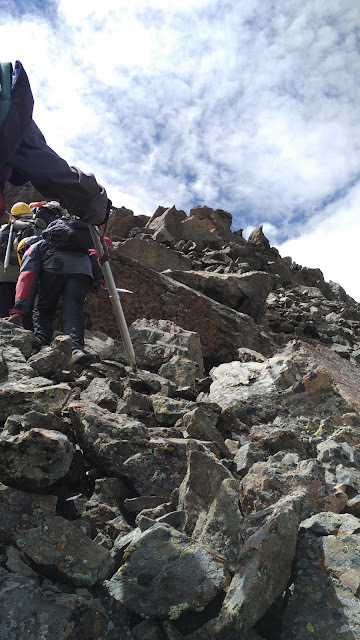 We decided to move ahead and walking through the rocks and over stones with each section we climbed, the summit appeared just next few steps ahead. But when we reached the top we could again see another ridge leading to the top. Before reaching the top we were almost exhausted that we walked few steps to take a rested for a minute. Our instructors were continuously motivating us and finally I heard the hooting of my friends who reached the top. We also began running and in no time we were there. And we did it, We Summitted an Unnamed Peak. At 17,483 feet we could see as far as Indo-Tibet border and some beautiful 6000 meter peaks and some peaks were just a little more high then we were. We clicked as much photos as we could and with as many friends as we could. All were congratulating each others as this was the first time that Basic course had achieved such a good height with 98% attendance at the peak and no dropouts from the batch. 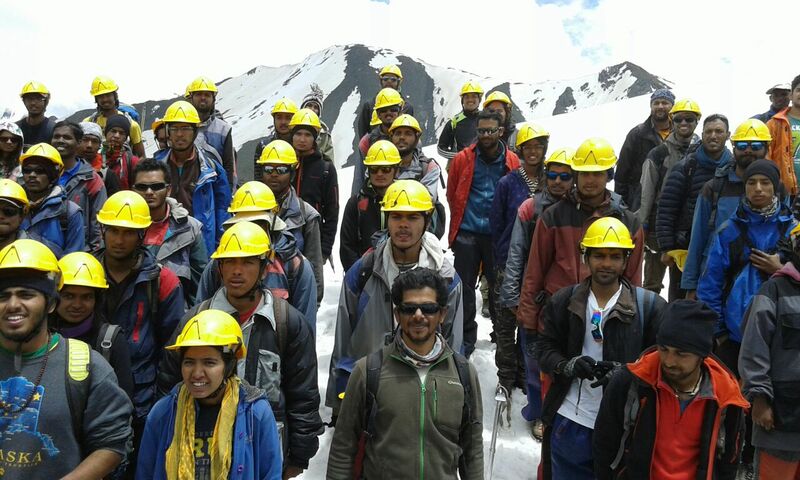 The credit goes to the our instructors and the difficult treks we did everyday to reach our activity site. 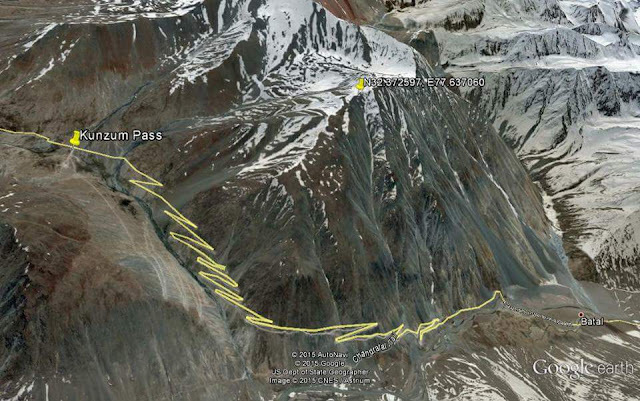 After some time we descended and reached the base at kunzum pass within two hours and further 1.5 hours to Batal. All were very tired so we had dinner in evening and slept early. Eating a cheese slice separately is an awesome thing to try in mountains. Today we were divided into two groups. One group will give test while others had to clean their equipment such as gaiters, snow shoes, crampons and axe. 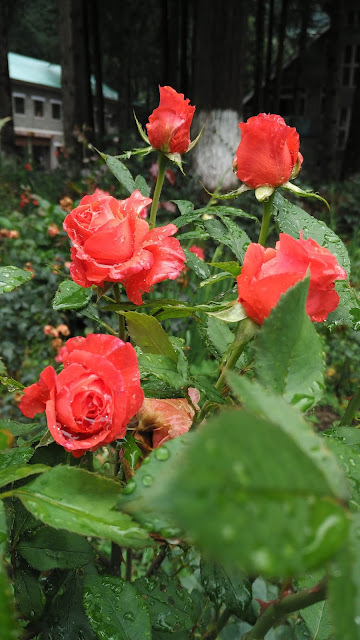 I was in the cleaning group initially after which we all began to practice for our test. Meanwhile advance course had arrived at our campsite and also set up their camp next to us. After three hours was our turn to give test. It consisted of four parts, the first one being naming all the equipments and their descriptions as they were displayed and I did very well. Then was my knots test which I performed well. 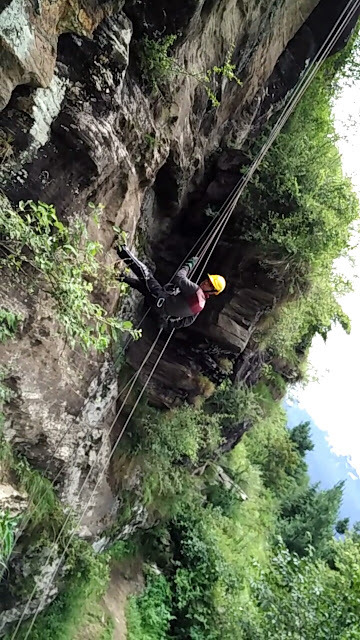 Then he asked me to demonstrate various rappelling techniques and in the end was the rescue test in which I had to prepare the setup for rescue (Z- Pulley Method). I was doubtful about what marks he would give me. 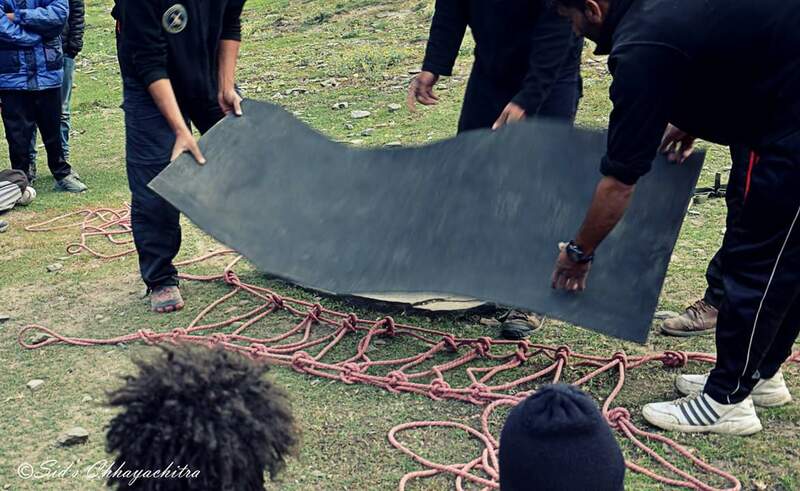 Later in the evening was a lecture on making stretcher using ropes and we practiced that. Making a hammock is quite similar to that. 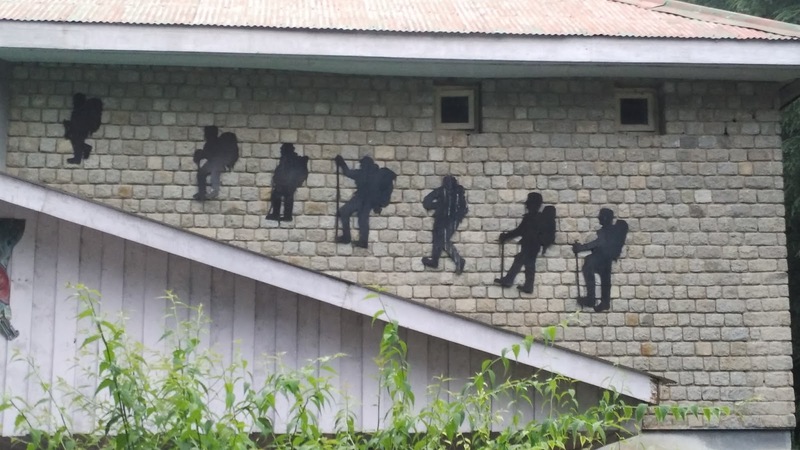 So the next days schedule was decided that we will trek to chandratal lake and that was optional and not part of any activity, as we had to cover 34 kms in a day. Today we got packed lunch as we had to return late in the evening. Most of the students including me did not take it as we couldn't anymore bear the aloo subzi and roti that used to convert into papad very soon. My group had heard from the nearby dhaba that there are small eating points near the lake so we skipped the packed lunch. We begin our journey at 8.30 AM and it took us long five hours to get there, meanwhile some students who did not want to come along as they could not walk had arranged a mini truck by convincing the driver who had stopped at the dhaba and some of them including our kitchen staff reached there before us. As we were moving we could see amazing breathtaking views of open wide valley and a small road passing through with chandrabhaga peaks on the left. The moment we saw the lake we were amazed, A fresh blue water lake in the midst of grey and brown mountains. We walked down to the lake and everyone could feel the cool breezee. We immersed our feet in cold water and sat on the shore. It appeared like a Beach in mountains. 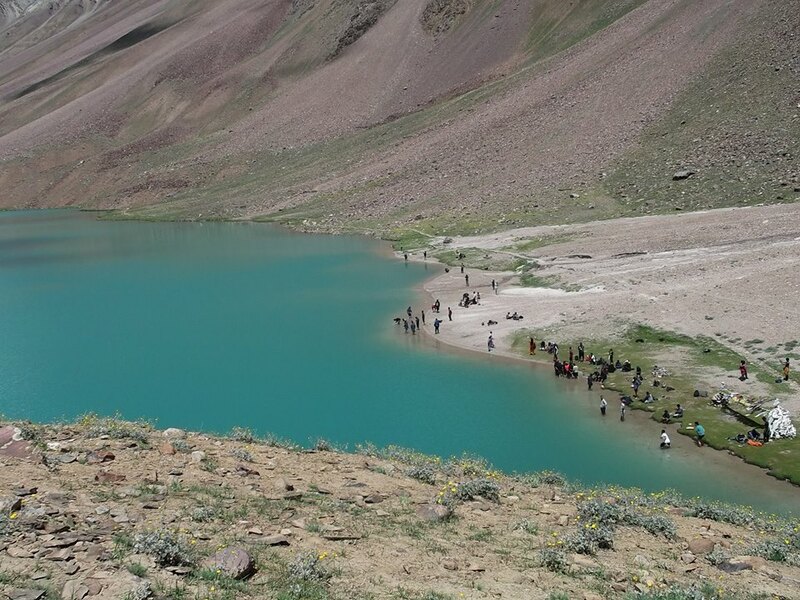 To our surprise there were no dhabas or eating points at the lake and thankfully I had purchased some snacks 2 kms before the lake from a stall. We ate our biscuits and chips and after spending an hour we had to move back to our camp. It was 2.30 PM and we marched back to our camp. the road with amazing views appeared as it was going to the paradise. 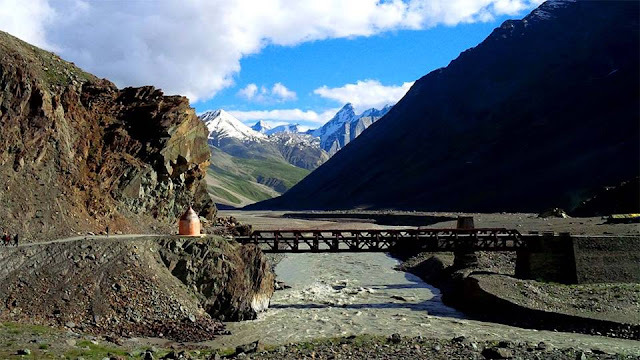 Actually, this bridge was next to base camp on the Highway that leads to Kaza, We could see this bridge on our way back only when we were 500 metres away from it as for the rest of the time it did not appeared to us. So upon seeing this we were relieved that we have finally arrived at our base camp. 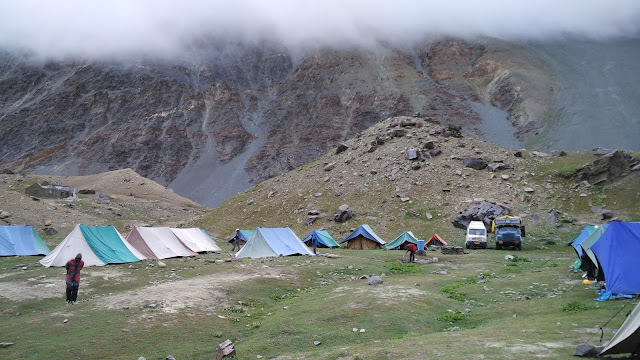 We had three journeys on this road , the first being on second day at Batal when we visited Kunzam Pass, next when we went for Height gain exercise and the third being this trip to Chandratal. Chandratal is a seperate route of 14 kms from the main highway and the road ends at the lake. We reached the camp by 6.15 PM and today again was a maggie day. I with my friends rushed early before the crowd could occupy the dhaba. Later in the night we were given instructions about next day journey to manali. We had to move at 9.30 AM, so we got up early, packed our bags and tent, had breakfast and collected the packed lunch. We began our journey with amazing views of mountains. The remix music was adding more energy to our bodies. 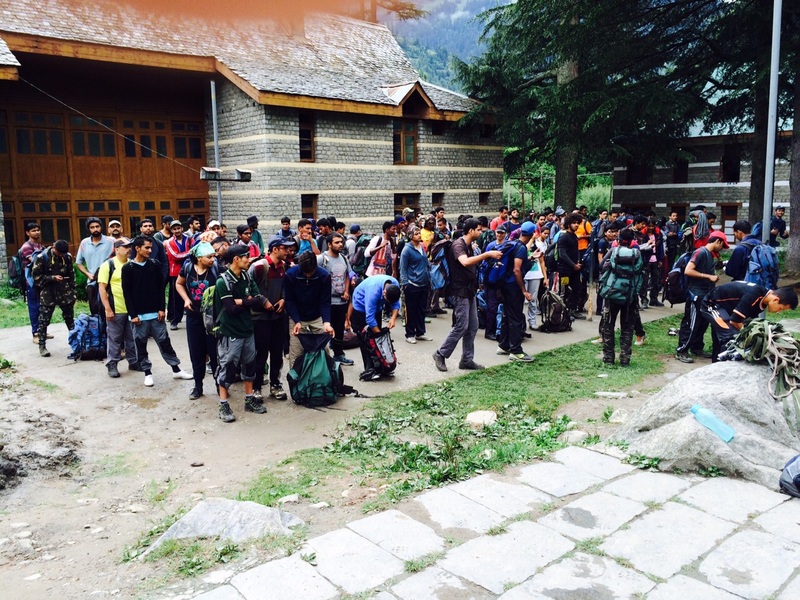 We reached manali by 3.30 PM and the first thing everyone wanted to do is collect our bags and have a bath . I was lucky to have it early. We had an opportunity to have bath at base camp one day, but most of us including me did not had as the water was too cold. Finally we called home after a long gap of two weeks. Later in the Fall in we were told that we had our written test the very next day and we begin studying at night. It was our test and it was really easy. Many were copying the answers and I scored well. After the test we had to submit our equipment's which consumed a lot of time. We had interview session later with our director where we had to give our feedback. We were told that today will be the closing ceremony. Later in evening the ceremony began at 7.30 PM and we were given badges and some special badges were also like clean Himalaya, Best male and female cadet, best rope award. 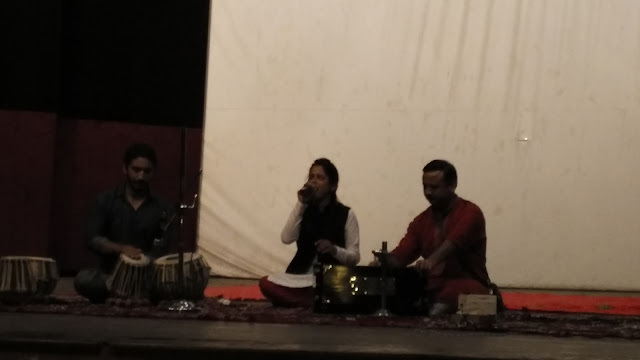 It was followed by a cultural dance and music and then course report was read. It was 10.30 PM by now and almost everyone's stomach was like an empty drum waiting to be filled. We had our dinner and all began dancing and singing as it was to be our last night. We were awake till late untill our instructors had to obstruct our fun and we were sent to sleep. 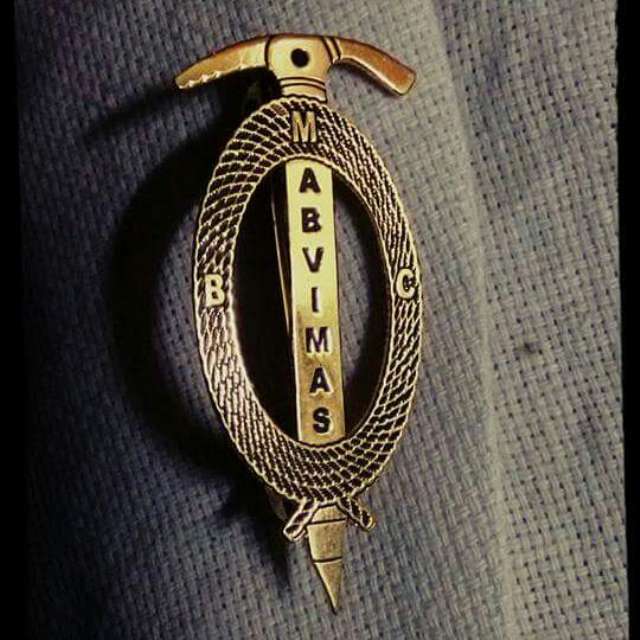 We were told to collect our leaving pass from 10 AM onwards and we also bought souvenirs like t-shirts, caps from the institute and I purchased a warm fleece jacket which our instructors used to wear. Almost all were going today except few who had to leave next day. We all went to market to cherish the last moments in Manali. And the journey ends with many awesome memories. Amazing, thank you so much for this? I wanted to ask, how much did it rain throughout the course?? Did the monsoon affect your course in any way?